Sergey Brin Major Direct Stock Holder Status? According to Google’s Major Direct Holders forms, it appears Sergey Brin is no longer a major direct holder of Google stock at least according to Yahoo Finance. Unless of course Mr. Brin somehow controls a major share of Google’s stock indirectly or in some other class that doesn’t require being reported by Google to the SEC. 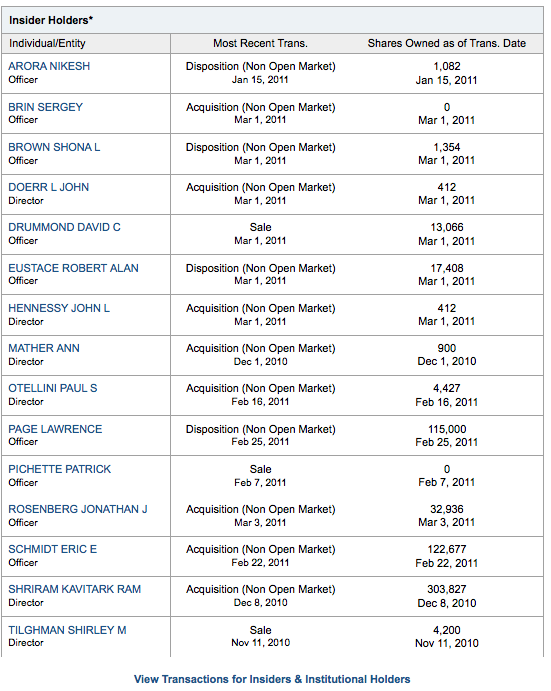 Or the Yahoo Finance site has somehow incorrectly reported Mr. Brin’s amount of stock ownership as 0 shares. Not sure how to reconcile these two different sets of numbers let alone this SEC filing showing Brin still owns 27,126,186 shares of Class A Common Stock. Assuming the SEC data is correct, then how can the Yahoo data be correct too? Or are these seemingly conflicting sets of data actually both correct? Class A Common must convert to Class B and constitute direct holder status which in turn carries voting rights and requires reporting to the SEC. 1). Convert more A at will as needed to vote? 2). Is the Direct holder report inaccurate as of March 1 because its constantly showing fluctuations in the # of shares management owns and as such have Brin’s voting rights have remained the same as before when he was reported to be a major direct stock holder? 3a). Are Brin’s or any other officers voting rights not tied to Direct Holder status at all? 3b). Or aren’t Brin’s and other officers voting rights tied to Direct Holder status and if so, what are the implications of his no longer appearing to be one? This entry was posted on March 8, 2011 at 11:07 am and is filed under Sergey Brin Major Direct Stock Holder Status. You can follow any responses to this entry through the RSS 2.0 feed. You can leave a response, or trackback from your own site.